Brown the chorizo in its own fat in a pot and add the minced garlic. Once ready, remove from the pot and cut into chunks. Set aside. Sauté the vegetables in the same pot and add the water. Season with turmeric and salt to taste. Once the water has evaporated, cover the pot and let cook over low heat until the grains of rice have opened. You can use ribs or chicken instead of chorizo. For many, Thanksgiving is about more than being grateful. It's also a great opportunity to enjoy delicious dishes. The food for this holiday is known for its abundance of dishes, including the star turkey that's served with several side dishes. 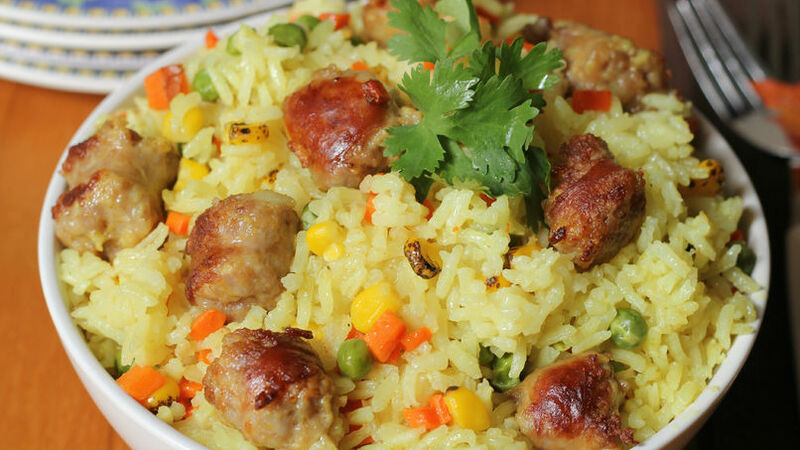 This rice with vegetables and chorizo is a perfect addition to the dinner. It can be prepared in less than 30 minutes, is made with few ingredients and provides that Latin touch everyone loves. It will surely be a favorite among your guests.